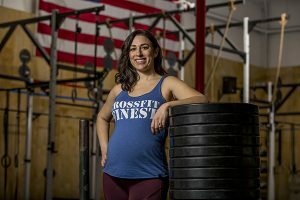 Jenn DiMarino, owner of Crossfit Finest in Metuchen is offering a free month of classes to any federal workers waiting for the shutdown to end. When Brian Kulbacki’s younger brother flew home to New Jersey for Christmas, he came to share a less than stellar reality: He was one of 800,000 federal workers affected by the government shutdown, and one of 420,000 “essential employees” who were required to work sans paycheck. Some businesses back home in Chicago are softening the blow, his brother said, by offering discounts and freebies to federal workers. One day later, Kulbacki started offering 20-percent discounts on flights of beers and packaged goods at his brewery, Departed Soles in Jersey City. Since then, businesses around the state have started to provide New Jersey’s more than 5,000 federal workers pick-me-ups of their own, like Montclair’s Little Daisy Bake Shop, which started offering free baked goods to federal workers on Sundays from 5 p.m. to 6 p.m. after hearing about a bakery in San Francisco doing the same. A huge part of craft beer, Kulbacki said, is a focus on the community. At Montclair Brewery, Owner Leo Sawadogo agrees. With a motto like “building community one beer at a time,” Sawadogo is offering one free pint and 10 percent off the rest of the tab daily to federal workers impacted by the shutdown. He was inspired by a Jan. 9 Stephen Colbert skit that emphasized the shutdown’s impact on craft beer. “It was satire at its best and made us really think about the people that are being affected terribly. And that although small, it may be a good way to make someone feel a bit better,” he said. Breweries, gyms, restaurants, and other shops are introducing new perks for the feds almost daily. Nearly a dozen businesses in the borough of Metuchen have activated some do-good offer for federal workers spearheaded by municipal leaders and accessible at ittakesaborough.com. Big G Movers and Friends of the Family Daycare are discounting their services during the furlough, while CrossFit Finest is offering a free month membership to those out of work. CrossFit Finest owner Jenn DiMarino said that being able to provide the $185 freebie is humbling. “It’s such a good feeling to even be in the position to help someone,” she added. Over in South Brunswick, Brunswick Brazilian Jiu Jitsu owner Garry Tonon announced via Instagram that he is also letting federal workers train for free during the furlough. Businesses aren’t just offering up feel-good goodies and ways to take the edge off. Some take a more serious approach: feeding people in need whole meals, and making sure their children are fed, too. In Westfield, Outta Hand Pizza is offering two meals per week to federal workers and their families. That’s two meals per person — so if someone has a spouse and four kids, they all get their choice of two meals per week. “We totally understand that our one or two meals a week won’t solve their problems, but I know for a fact that at least on one or two nights, they won’t have to have a conversation with their children why they can’t have a warm meal,” owner Burim Regjaj said. Regjaj said he’s working with the mayor of Westfield to create an even bigger program for federal workers to perhaps provide more meals and services. Though the branches of the military are still getting paid during the shutdown, the Coast Guard, which was shifted in 2003 from within the Department of Defense to the Department of Homeland Security, are working without a paycheck. Mark Callazo of Atlantic City restaurant The Iron Room has a special offer for the Coast Guard members and their families, which has a large presence in Atlantic and Cape May counties, offering up their $19.95 blue plate special Tuesday through Thursday evenings from 4 to 10 p.m. Two weeks ago, he served up Kobe meatloaf. Last week, it was a hearty beef stew. “I can’t imagine having to get up and go to work every day, and it’s not like it’s easy work, and not getting paid,” Callazo said. Alcoholic Beverage Control laws prohibit him as a liquor license holder from giving away free alcohol, but community members who caught wind of his offer have stepped up to the plate to donate money toward dinnertime drinks for the servicemen and women. “It was a couple hundred dollars. I don’t know how long that’ll last, I think we spent all the drink money last week, but maybe we’ll get more in this week. If they want to, people can donate money to buy them drinks while they’re in here,” he said. North Jersey restaurant owner Srini Rao is offering free lunch seven days a week at Nirvana Indian Kitchen in Allendale and Downtown Dhaba in Westwood. Federal workers and their families can come in everyday for a free lunch, a payback he credits to the community’s welcoming of him as an immigrant business owner. And for federal workers worried about providing for their four-legged family members, The Scottish Dog in Metuchen is offering necessities like pet food and litter during the furlough. “For some people it’s possibly going to be hard enough to feed their family, now add a beloved pet and the possibility of giving them up because you can’t feed them. It’s devastating,” she added. Federal workers can reach out to Fitzgerald in store, on her Facebook page, or her website. With a federal ID, she’ll help them, no questions asked. For small business owners, their helping hands are more a neighborly gesture than a political statement. “Whether you got a paycheck or not, and no matter what side of the wall you’re on, we got a beer for you,” Departed Soles’ Kulbacki said.